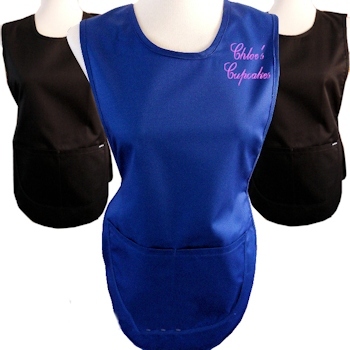 Embroidered personalised cotton tabard with front pocket that can be embroidered with a name or business name or logo great for those in catering, hosting, childcare or salons. Embroidered personalised cotton tabard with front pocket that can be embroidered with a name or business name or logo great for those in catering, hosting, childcare or salons. Have your name, initials, nickname or company name embroidered in your choice of colour and font style across the top left. Makes a unqiue and useful gift or stylish workwear for yourself and employees. Please allow approx 3 days for your customised tabard to be dispatched.